On Monday, I took my last cycle fitness class (I began those in late October). This last class I sprinted hard for 3 minutes ten times, with a 3 minute rest in between. Saw some pretty elevated heart rates! Tuesday, after 7 am Boot Camp (more sweating and lots of quad exercises) – and a shower, I helped pack my bike to have it shipped to Phoenix (wind chill here in the single digits, hoping to find warmer temps in AZ). For inspiration, on Wednesday, I had brunch with Willie Weir, in town from Seattle, after returning from a 3-month bike trip in Myanmar, Laos, and Cambodia. He reminded me to really listen to the sounds of the road, and see the splendor of the land. Thursday was my last exercise class at church, lots of arm reps. Everybody wanted to know when I was starting my journey. The weekend will be spent packing, last minute errands, and good byes to my grand kids (and their parents). While I still have 2 weeks, almost, until my tour begins, the “orchestra” is warming up…. 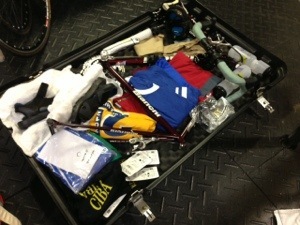 Under the clothing stuffing is my bike frame, seat and handlebars. 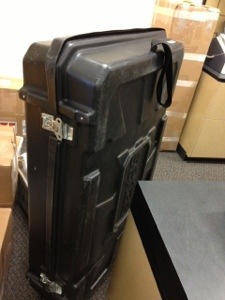 The fully packed bicycle headed to Phoenix. We must continue to remind ourselves to have fun and see the sights. Right now, I think many of us are preoccupied with whether we are prepared for this journey.